I run into a lot of strange teas. I’m pretty happy trying out new things, things that I have never encountered before or tasted before. Since sampling is not always a possibility, sometimes I buy a whole cake just to try it out, especially if the price is not too high. Sometimes it ends in a jackpot where the tea is great and I can buy more, other times (and this definitely happens more often) it ends up being a rather unhappy event with a really bad tea. Once in a while, I get weird stuff that I can’t quite figure out. The tea I drank today is one such thing. Ignore where the tea is from and the label – they don’t really matter. As you can see, I’ve already chewed through almost 1/3 of the cake, and I still haven’t quite figured this tea out. The leaves look decent enough, and it’s one reason why I bought it from Taobao in the first place — it looked ok and wasn’t too expensive, so I figured I can give it a spin. The tea, however, was a bit of a surprise when I first brewed it, and has kept on doing it since then. This is the first infusion – and this is where the trouble lies. 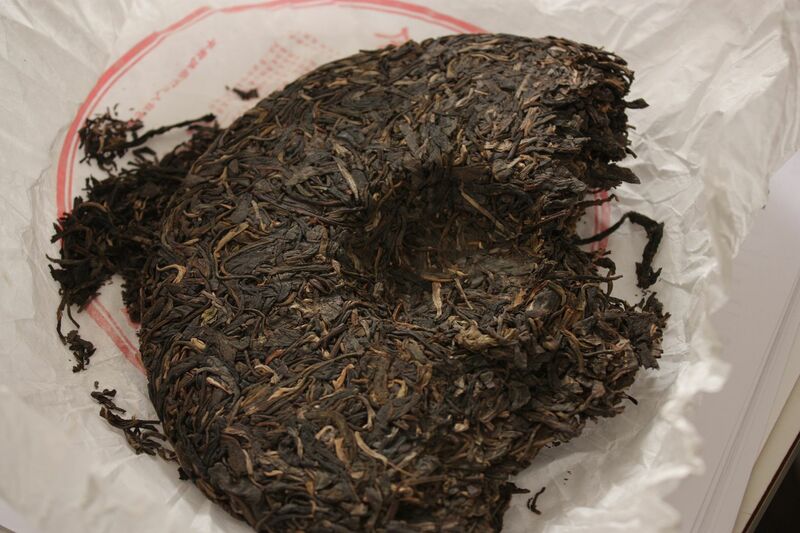 The tea smells, not of a normal puerh, or a Yiwu (which this purportedly is) or any other recognizable mountain. It has a strange, slightly acidic smell that’s rather sharp and somewhat unpleasant. I dumped the first infusion today after taking a sip. The liquor, as you can see, is quite dark, and so are the leaves. In fact, some of the leaves are very dark – a dark green, mind you, not dark brown a la storage. The tea, however, improves, much like how a badly stored puerh can get better after the first few infusions wash away the storage taste. After the first two or three infusions, the strange smell dies down, although never quite going away. The tea is somewhat bitter – the bitterness is always present, although it smoothes over into sweetness when you swallow. You can tell there are good puerh leaves in here, because the telltale flavours and body are there. At the same time, it is slightly unsettling – I even feel slightly weird after drinking it. The tea lasts forever though. I went through two and half kettles of water before it started giving up on me. It has infinite rebrewability, so much so that I just had my last cup. The tea is brighter and softer now, the odd smell almost gone, but not quite. Because of the tenacity of the smell, I don’t think it’s a storage problem. If it were, I should be able to smell the odd smell even when the leaves are dry, but I cannot. It really only becomes apparent when hot water hits the leaves. This makes me think that something is inherent in the leaves to make this happen. Is it mixed in with some non-tea leaves? Does it explain the bitterness as well? Is it an accident? Deliberate (to pad costs, presumably)? More importantly, will this age well? 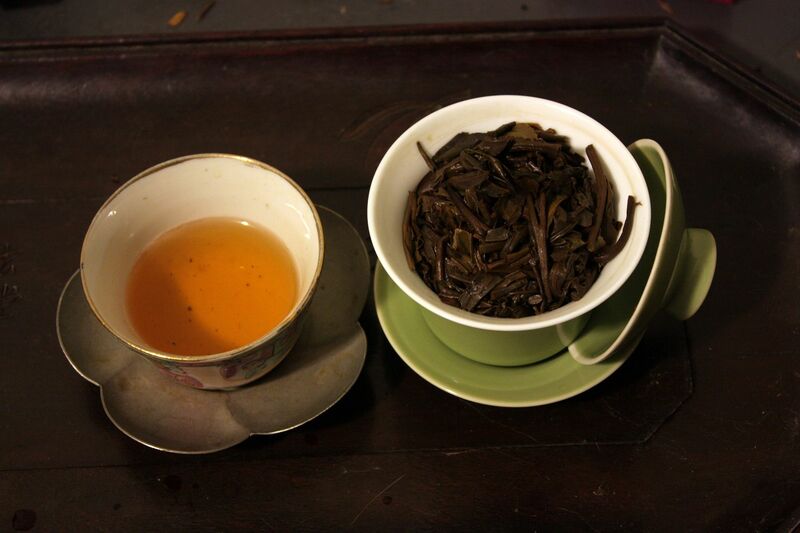 The leaves are flexible, so at the very least, it is not terrible tea. But that offputting flavour…. I know I’ve said on multiple occasions that flavours don’t really matter if you’re evaluating a tea for aging, that they change (often drastically so) and body and feel are much more important when tasting a tea. Yet, some things, like this odd smell, are hard to ignore, and probably unwise to ignore as well. I am guessing that there’s some non-tea leaves mixed in here, creating the strange smell and slightly unconventional taste. Is this bad for me? I have no idea. It may very well be perfectly fine, and will age into a great cake, but it could also just have this fundamental flaw that is hard to get rid of. Traditional storage would solve a lot of these problems, I think. Sometimes a traditionally stored tea that has lingering bitterness – I wonder if those cakes tasted like this one when they were younger too. Either way, it is what it is, and another session later, I’m still no closer to answering my own questions about this cake. I must admit to being a puer novice but your observations are interesting though tantalising that the internet cannot convey aroma and taste (yet?). 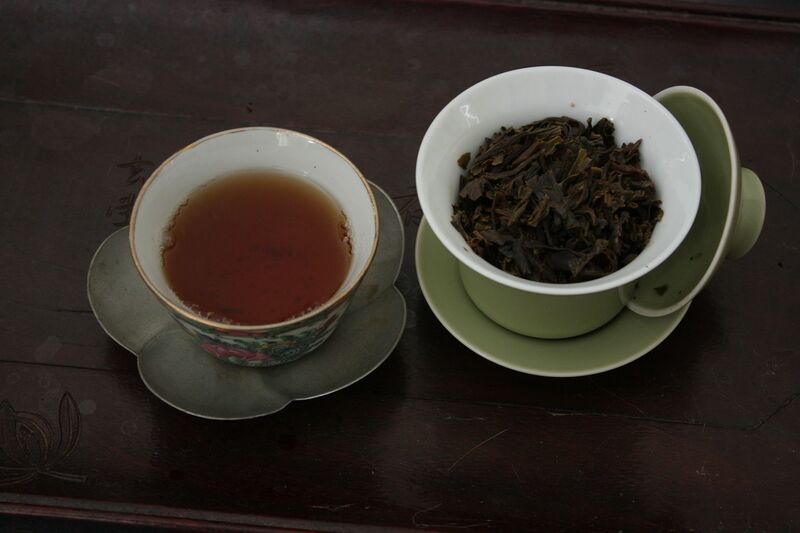 As a survey of teas from Laos I have been tasting a tea made from wild trees at end of 2010 in the maochar style for sheng – it is intensely bitter, though with a floral background. On a second steep it became more bitter and I gave up. 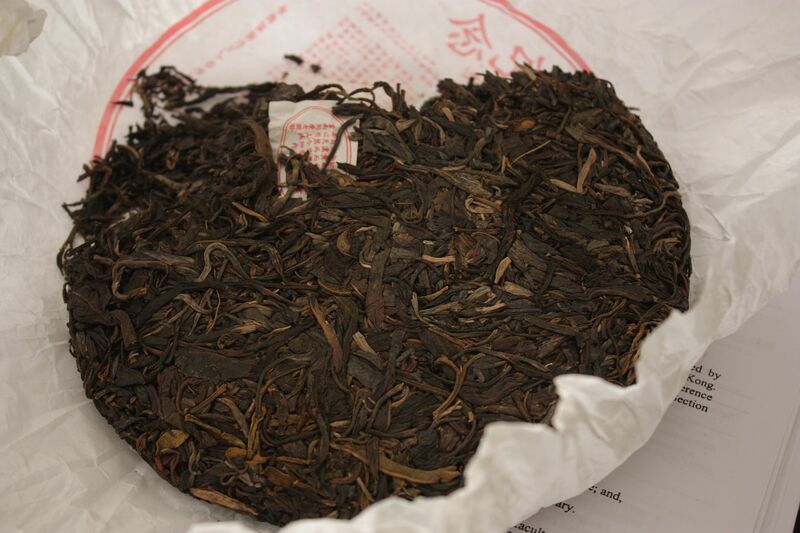 I believe a lot of these maocha teas have a slight bitter note that recedes during maturation. Sounds like yours was either exceptionally bitter to begin with (and not lost it all yet) or the mechanism for losing bitterness during storage did not kick in. Yes, I did suspect that this is partly a “border tea”, which tends to be more bitter than Yunnan teas. The lingering bitterness and oddness shouldn’t have gone away yet, since this tea is only a few years old. What concerns me is that odd taste, and the slightly odd sweetness that accompanies it. I really have no way of finding out what it is, and I might just have to leave it for now — stop drinking it — and see what happens to it five years down the road. Or even non-teas of some sort — some other plant that was harvested together.